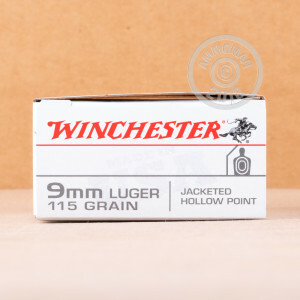 This cost-effective "white box" 9mm Luger hollow point ammunition from Winchester performs well in both target practice and self-defense roles. 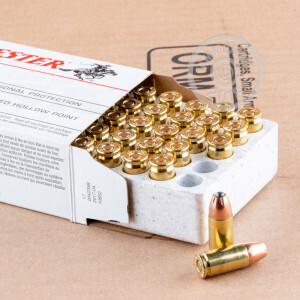 Packaged in a case of 500, these cartridges fire a light 115 grain JHP bullet at a muzzle velocity of 1,225 feet per second, delivering reliable expansion and a reasonable level of penetration. 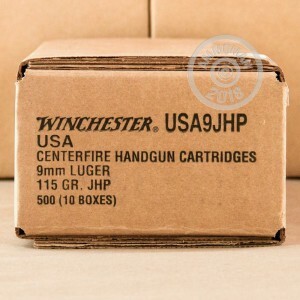 Like other Winchester products, this ammo is manufactured in the USA using non-corrosive Boxer primers and Brass cases. Buy this case and find out why high volume shooters keep coming back to AmmoMan.com to stock up. We ship all orders over $99 at no additional S&H charge. Ammo works great not a miss or hiccup.